OSWEGO, NY – The Children’s Room at the Oswego Public Library is excited to announce special events and activities for the fall. Lucy wants someone to read to her. 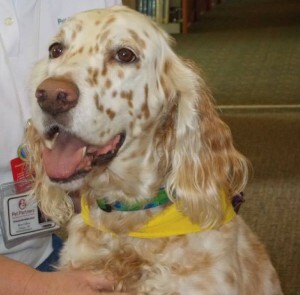 Read with Lucy – Beginning on September 15, Lucy is returning to the library. She is a therapy dog who loves to be read to. It takes place on the first and third Tuesdays of the month at 6:30 p.m.. Bring your children so they can come read to Lucy. Storytime with Alexa – Takes place on Thursdays at 10:30 a.m. Alexa is a senior at SUNY Oswego interning at the Oswego Public Library. Let your children come hear stories and complete crafts with Alexa. The first Storytime with Alexa will take place on September 17. Lego Club – Children can have fun at our Lego club. Lego club takes place on the second Thursday of the month, beginning on September 10. The club runs from 6-7 p.m.
All Children’s Room programs at the Oswego Public Library are free and open to the public. Please call 341-5867 if you have further questions.